SCVJeff had a great idea about starting a sticky to share details about LCD TV conversion projects. 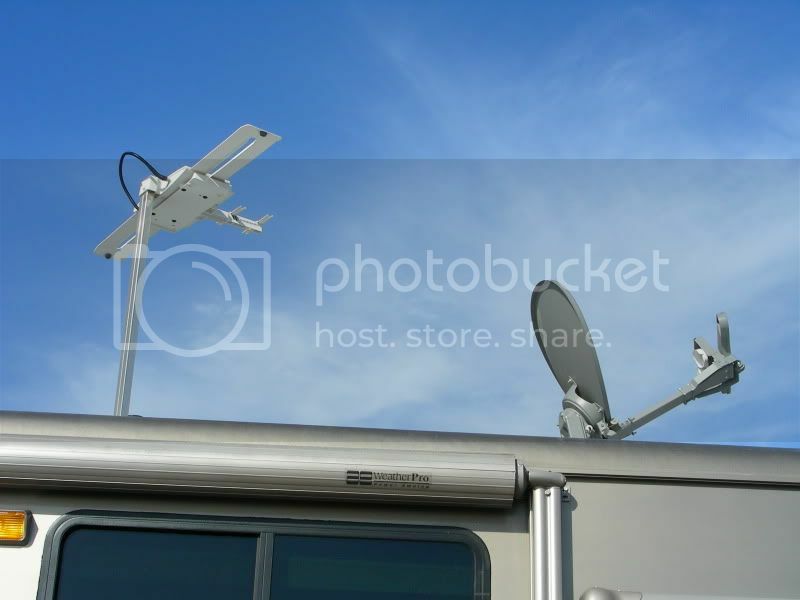 We want to limit the topic to only reports of conversions in Winnebago Industries products. We installed a 32" Magnavox LCD in the front, and a 19" Magnavox LCD in the rear. Then I added dedicated DVD players to both front and rear via HDMI cables. I linked in the existing Video Selector Box to both front and rear, to retain all the original functionality (satellite, antenna, cable, & shared VCR/DVD player). I installed the Wineguard Wingman, with some improvement on over-the-air reception. My greatest achievement is replacing the rear TV with a bookcase! Arne....and I LIKE IT TOO! Any pictures or info? I've got a TV rack in the bedroom of the Sightseer that I'd love to remove and replace with a bookcase. I always need places to put books. Not sure why this would be a question or survey that one would want to limit to Winnie's only. Seems to me that a TV is a TV. Unless there is some huge difference that I am not aware of? This thread is in this section because there are some "idiosyncrasies" in the wiring configurations on the Winne. John started a parallel subject in the Tech section for everyone else so we don't have to wade through the Winne only idiosyncrasies. Fair enough - thanks for the knowledge. After being tired of looking at an extremely mis-converged CRT I decided to pull the TV and fix it.. until it was on my shoulder and I said there was no way it was going back in. After CAD'ing up my cabinet I spent hours at WalMart, BestBuy, Sears, etc. looking at what would fit and look OEM, finally settling on the Sharp LC-32SB24U. This apparently is a BestBuy, WM, (and I'm sure others) "store model", but it has one of the best pictures of all I've seen, and even at 720 for a 32" is just fine. Geeeze, it's just camping! Do buy a Wingman! They absolutely help the OEM batwing, but are not the magic answer to being 75 miles away. It's a cheap upgrade to the batwing. HERE is a geek test I did on it awhile back. Don't buy a 4x3 screen! It may be a good deal and fit within the frame, but the world is going 16x9 and these displays will either cut off the edges, or force you to underscan to see the antire pic, just as with a CRT. The TV should be able to "update" it's scan (mine doesn't) so when you go to a city and do a new scan, then move to the next place and do another scan (or update), you won't lose what you previously scanned. The TV will only stop on a channel that has signal so you are not entering useless channels, but this prevents you from having to do an entire channel scan every time you move. Anytime you return to that area you already have the local channels in memory. Make sense? If you run the TV into an external audio system and want to use only the TV remote, MAKE SURE that the TV not only has external audio out, but it is VARIABLE output that tracks with the TV's volume control. In the case of the Sharp listed above, it has a pull-down menu that selects internal speakers and fixed external out, OR internal speakers off and variable audio on the RCA Line level outputs. The Sharp also has a 5.1 optical output that plugs into my Sony VHS/ DVD/ Surround system that I think also tracks the TV's volume. I'm not familiar with the Winne "built-in" surround, but anyone having the Sony combo will find an optical input in the rear that interfaces with the TV just fine. This seems to be a hot button.If you're not sure, get the model# and look for the manual on the web and see what it's supposed to do. It has a USB jack for firmware updates. Haven't use it yet. When dry camping, keep the brightness down as there is a significant difference in consumption depending on brightness level. One thing about this install is that the TV mounts on top of the frame, meaning that the only way to secure it is to have the lower shroud removed. No problem as I was able to dress the cables and really secure the monitor down. The rear 8 screws are more than enough to hold it in, it doesn't need to be mounted to the frame in front. One more thing.. Installing this monitor involved sawing about 1" off of either side of the frame, so it's an intentional snug fit. To keep the squeaking and wear down, I bought a package of thick sticky-backed felt from Home Depot and cut it into 1" strips that now line the interior of the frame. The only two things the monitor comes in contact with are the rear mount and the felt lining. Jeff, I'm having difficulty determining just what I'm looking at in the coach bracket photo. 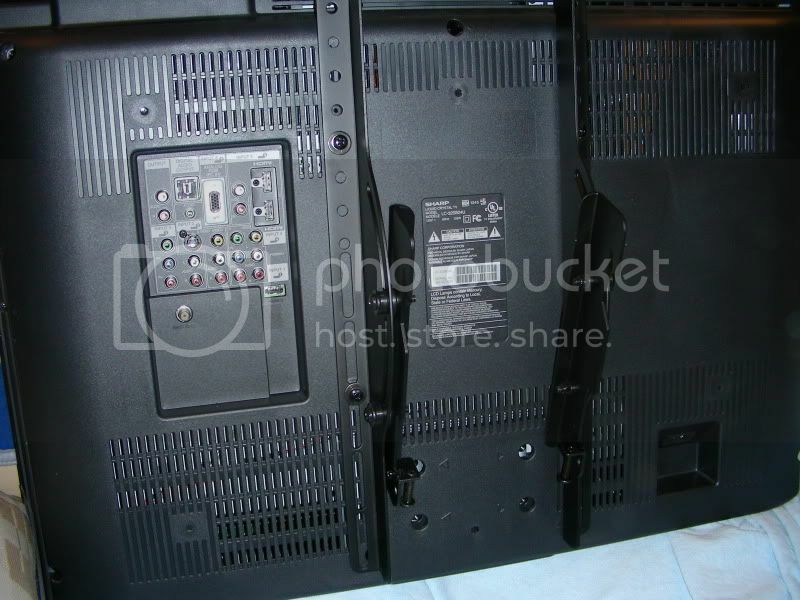 Is the hardware mounted on the rear of the TV custom made or part of a manufactured mount? That is a shot taken with the lower shroud off and the TV mounted. That is a piece of 1" aluminum L-stock bolted to the Winne frame. Bolted to that are 2 pieces of 1"x1" steel square stock that the LCD bracket is bolted to. Mike - it's more of a 'what will fit' a particular hole due to Winnie cabinetry. For example, Rex (LK23) and I have identical coaches and he has replaced his 27" CRT with I think a Sony Bravia. I can duplicate much of his effort and avoid trial and error on my own. Also, dissecting Winnie TV cabinetry can be a challenge. I have seen many questions about "how do I remove my TV", obviously every house builder does things differently. I like Jeff's idea of just putting in a 32" flatscreen in the FRONT of the cutout. I haven't done it yet because I am not in a rush to throw away our perfectly good Sony 26" tube TV, as we aren't fulltiming quite yet. I like Jeff's idea of just putting in a 32" flatscreen in the FRONT of the cutout. That's what Mike did in our Sightseer. He's still tweaking the bracket that holds it and lets him swing it open so the area where the big honking tube TV used to can be used for storage. Jan says: "You don't have to shovel SUN!" We would like to replace the (above the dash mounted) tube TV in our '03 Brave with a flat screen but still retain the plastic frame. Has anyone done this particular job? "We survived for several days on nothing but food and water"
The best thing to start with is really good measurements, preferably in the form of a drawing, and hit your local TV store with a tape and see what fits. With all that nice Oak surrounding it you might elect to replace the frame anyway. Wendy: You're right, mine is solidly attached and I do lose potential storage in the rear, but I also have quite a harness off the monitor now and decided I didn't want anything banging into it. I made a front TV change on my 03 Itasca Horizon which is a little different than most. The description is in the forum library. Tom arranged my information very well to give the complete story. I really like my installation. Give it a look. We are full-timers and working professionals in the Seattle area. We live in an Itasca an 33U 03' Suncruiser. I am considering moving the boat anchor (TV) from the neck bending position above the drivers area to the space next to the door where we have the recliner. I moved the recliner out to the storage shed and often sit in it on the weekend outside. Nice and comfy under the tree. Anyway, I think that having our TV directly facing us when we sit in the couch would make far more sense for us. The couch reclines of course and it has the snack tray and so forth. I also do IT work from my coach and would like to hook one of my PC's up to the HDTV monitor and use if with a wireless keyboard with trackball from across the room on the couch. I'm thinking a nice cabinet that hides the TV in back and gives us a place to put the shoes and other often used stuff right next to the door. Perhaps a small TV Stand/Cabinet would fit. Hi - welcome to rvforum! Our floorplan has the TV on the side which was a primary attractive feature - never cared for over the dash TVs. Yep! Arne (above) did.....I PMed him and asked him to post his link. I just bought a little 22" LCD/DVD combo TV but I haven't a clue where to mount it. My old Winnie doesn't have a TV cabinet or anything like that. 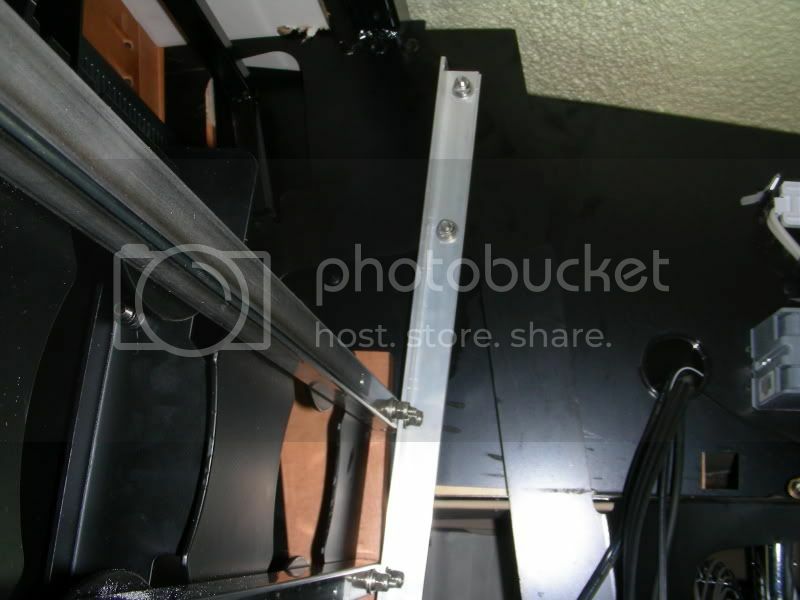 I have an arm mount that I was using at home for a larger TV and I was thinking of mounting it on the cabinet close to the door where it can be seen from the couch and chairs. I was also going to run my rear view cam into it. Hell, I turn around in every other vehicle to back up anyways. Any pit falls with this, besides being in my way when I come in the door? It does fold up close to the surface it mounts to. 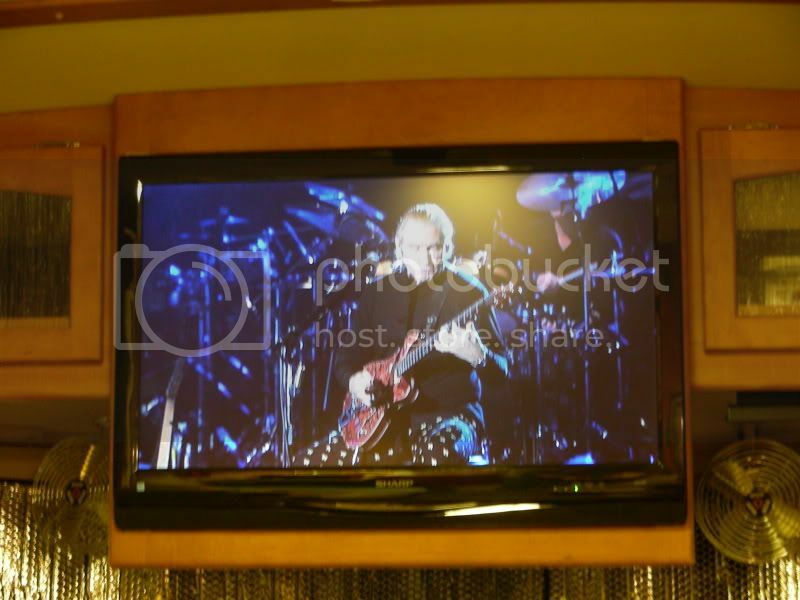 We recently installed the 32" Vizio HD LCD TV that we have been using on the dresser of our coach. We removed our bedroom TV in 2004, shortly after buying the coach new, and installing a stack washer and dryer, after which we had Winnebago build us custom doors to match. In the process, we lost the location for the tube TV and have been moving the LCD TV from the bed to the dresser as we go. Since we don't need the bedroom mirror over the dresser, we decided that this was a great place for the new LCD TV to go. We disassembled the dresser and hutch containing the mirror and were delighted to find that the mirror has a subframe and just unscrewed from the hutch. After measuring, we fitted a piece of 5/8 plywood and routed the back of it to allow the connecting and power wires to pass behind the TV out of sight. We stained and finished the wood, and then carefully installed it to the hutch frame. Perfect fit! Next, we wired a Geffen HDMI extender system, the coax from the front AV cabinet (antenna, etc) and a 4 meter long HDMI cable, together with the power cord and a small wire for an IR extension receiver, all in the groove of the wood. The HDMI extender uses 2 CAT5 wires to extend an HDMI signal, and we ran ours to the front AV cabinet so we could watch HD TV from the Satellite (if ever King Dome would get it together for Directv HD), and an infrared extender emitter to allow control of the front satellite receiver from the bedroom (newer winnies already have this, our relic did not). The other HDMI cable runs to the bedroom closet shelf, where we installed a BluRay player and another infrared emitter for control with the closet door shut. Next, we measured and centered the TV on its mount, in the space, installed the TV and connected the cables. We installed an electrical outlet under the dresser to power the TV and the HDMI extender and IR receiver system, and mounted each of those systems, carefully routing the wiring and securing them with zip ties. Voilla! It works. Here are some pictures, and a few shots of the new stainless backsplash we just installed. They're 1" x 4" beveled individual stainless steel tiles, and it took a while to get them in! I also added before and after pics of the headlight upgrade. 2004 Horizon 40AD, Added roof top air, hydronic heat/hot water, washer and dryer, prosine 2000, new HID headlights, and other "necessary" improvements ! Next up, Lighting control and redesign of slideout seals. That is some great work! There have been several TV conversions posted and I read every one of 'em several times. The turning point for us was a really bad squeak in the original 70# TV mounting that had to be fixed no matter what and after I got into that, I decided to put a new LCD digital TV in place of the old Sony. We looked and looked and decided that the largest would be a 32" version and a more compact install would be a 26" version. I also really wanted to get rid of the "head banger"... that's what I called the old TV since it was so tall, it was 10" or so lower than the cabinets on either side and stuck out several inches. So, I got the old TV out finally... the secret being to take the 8 screws holding the plastic trim in place out, then the four screws holding the wood trim out (inside the cabinets on either side) and then the metal frame for the tv is accessible. Remove the 5/16" bolts from either side and undo the wires and get two people and tote the monster to the garage. Then we built foam core board mock ups of the large lcd and a smaller lcd. We decided on the small lcd because we could make the whole thing kinda "get out of the way", 5" higher and about 5" forward and still use the original trim board as well as the plastic trim after some mods. We picked a Sanyo 26" LCD. Consumer Reports gave it a decent rating and it was the lowest price 26" at Wally World. The hardest part was cutting the metal and then re-attaching the metal base and getting the trim to look acceptable. I attached some photos that will illustrate the whole ordeal. If you have questions, let me know. thanks, Gary. Sorry, but I forgot to mention that I used a piece of 3/4" plywood to mount the LCD and then bolted the plywood to the steel angle pieces in the photos. It is rock solid. Looks great, Gary. Wanna come do mine?